Do governments seeking to collaborate in such international organizations as the United Nations and the World Bank ever learn to improve the performance of those organizations? Can international organizations be improved by a deliberate institutional design that reflects lessons learned in peacekeeping, the protection of human rights, and environmentally sound economic development? In this incisive work, Ernst Haas examines these and other issues to delineate the conditions under which organizations change their methods for defining problems. 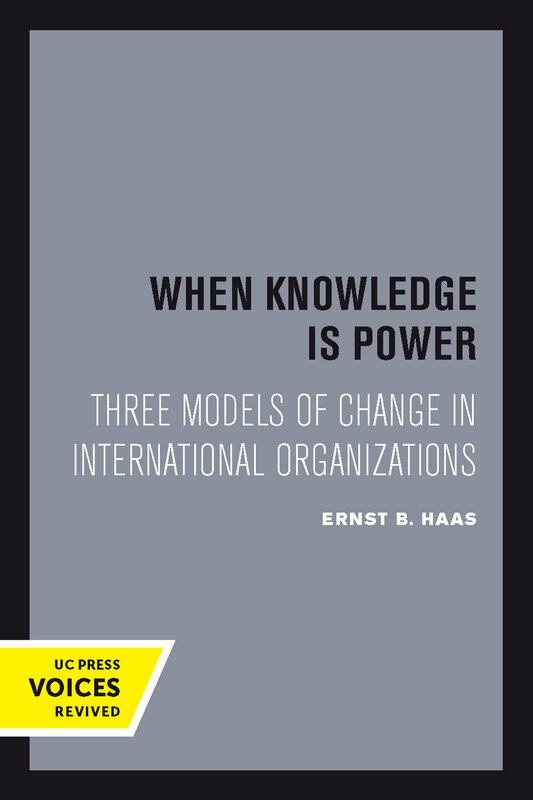 Haas contends that international organizations change most effectively when they are able to redefine the causes underlying the problems to be addressed. He shows that such self-reflection is possible when the expert-generated knowledge about the problems can be made to mesh with the interests of hegemonic coalitions of member governments. But usually efforts to change organizations begin as adaptive practices that owe little to a systematic questioning of past behavior. Often organizations adapt and survive without fully satisfying most of their members, as has been the case with the United Nations since 1970. When Knowledge Is Power is a wide-ranging work that will elicit interest from political scientists, organization theorists, bureaucrats, and students of management and international administration. Ernst B. Haas is Robson Research Professor of Government at the University of California, Berkeley and author of numerous books on international organizations.